There are many varieties of flour on the market today and with a little basic knowledge, you’ll be able to navigate the baking aisle like a pro. Learn about the components, characteristics and best uses for the most common varieties of flour. Endosperm: This is the starchy center of the grain, which contains carbohydrates, protein, and a small amount of oil. Most simple white flours contain only this portion of the grain. Brain: The outer husk of the grain, known as bran, adds texture, color, and fiber to flour. Bran gives whole grain flours their characteristic brown color and rough texture. Germ: The germ is the reproductive epicenter of the grain and is a concentrated source of nutrients. Flour that retains the germ during the milling process will contain more vitamins, minerals, and fiber. Gluten: Gluten is a protein found naturally in the endosperm of wheat. It gives strength, elasticity and a characteristic chewy texture to yeast breads, pasta, and pizza dough. All-Purpose: All-purpose flour is made from the endosperm of wheat. This flour is often bleached to give it a clean, white appearance and enriched to include nutrients that are lost due to the removal of the germ and bran. All-purpose flour has a medium balance of starch and protein so that it can be used in a wide variety of products without being too heavy or too delicate. Unbleached: Unbleached flour is similar in composition to all-purpose flour but has not been chemically bleached. Unbleached flour can be used successfully in as many recipes as all-purpose flour. Unbleached flour is a good choice for those who are concerned with flavor purity or exposure to chemicals. Bread Flour: Bread flour contains a higher ratio of protein to carbohydrates than all-purpose, which produces stronger dough. The strong gluten matrix provides structure to rising dough and gives the end product a nice, chewy texture. 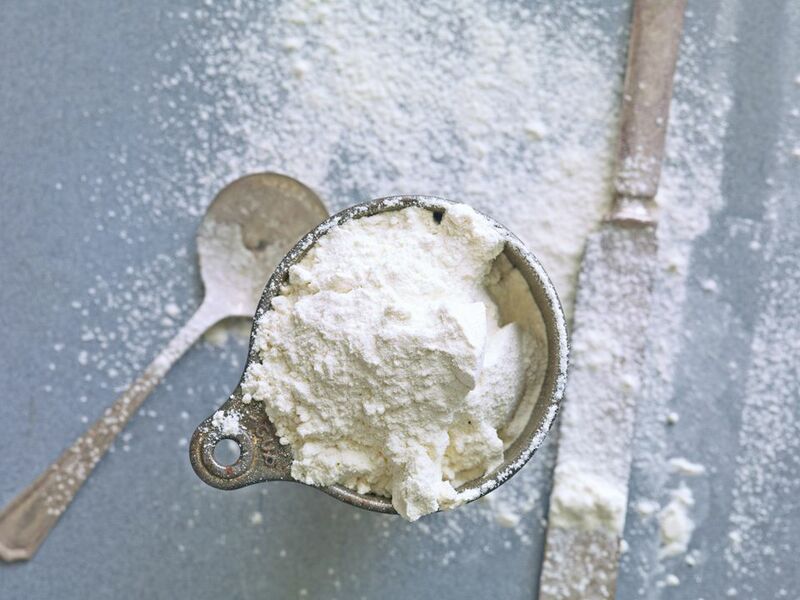 Cake Flour: Cake flour contains less protein than all-purpose and is milled to a finer texture. These two factors combined create a softer and more delicate crumb. Cake flour is often bleached to improve its appearance. Pastry Flour: Pastry flour has a medium protein content and is between all-purpose and cake flour in texture. The fine texture produces flakey pastry crust while the slightly lower protein content prevents pastries from being too dense or chewy. In addition to pastries, this flour is also great for making cookies, biscuits, and quick breads. Self-Rising: Self-rising flour is mainly used to make biscuits and other quick breads. It is comprised of all-purpose flour, salt and a chemical leavening agent such as baking powder. Self-rising flour should never be used to make yeast breads. Whole Wheat: Whole wheat flour is made by grinding the entire grain (endosperm, bran, and germ). This flour contains more nutrients and fiber than all-purpose making it popular among health-conscious individuals. Since bran can interfere with the formation of a gluten matrix in dough, whole wheat flour often produces a heavier, denser bread than all-purpose or bread flours. Stone Ground: Stone ground flour is the same as whole wheat flour but is milled to a coarser texture. Stone ground flour is valued for its characteristic rough texture and rustic look. Semolina: Semolina is flour made from a specific variety of wheat known as Durum. Durum wheat has an exceptionally high protein content, giving it a very dense, chewy texture. For this reason, semolina is most often used to make pasta. Rice Flour: This flour is made from milling grains of rice and can be found in both white (endosperm only) and brown (whole grain) varieties. Rice flour is lighter in texture than wheat flours and is a popular choice among those who are intolerant to gluten. Masa Harina: Masa Harina is flour made from milling corn that has been treated with an alkaline solution, usually containing lime. The lime helps loosen the corn’s husk prior to milling and improves the nutritional content of the flour. Masa Harina is used to make tortillas, tamales and other dishes popular in Central America.